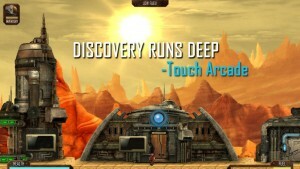 After a week collecting excellent reviews in iOS, Mines of Mars has arrived to the Google Play. It has been created by Crecent Moon Games, originally developed for PC (Windows , Mac and Linux), and has jumped now to mobile devices. It is an adventure game in which we make our way through the subsurface of Mars, with the objective of annihilating all the creatures that we could find in our way. We started the adventure in an old mining town built on the ruins of an ancient civilization. As we begin to make our way through the underground galleries, we will discover that the story is more complex than it seemed. Game development is changing depending on the excavated path, so you never will play two identical games. Throughout the galleries, we will collect gems and minerals we use to improve our equipment, which is composed by digging tools and by a good collection of weapons, which will allow us to deal with the enemies that we are going to find. The controls of the game are very simple, both for digging and fighting, but sometimes this simplicity leads to a loss of precision, which can result in a more chaotic battle than we planned. Furthermore, Mines of Mars has a good rhythm. The amount and location of minerals and gems is well balanced with the improvements required for our equipment, and battles are a nice addition to the periods of excavation. The Evan Gipson’s soundtrack is very elegant and helps to create an interesting atmosphere. Crecent Moon Games has announced major enhancements for future updates, such as cooperative excavation mode. Mines of Mars is available for iOS and Android for $4.99 in the App Store and the Google Play respectively.